June 1st is Narcissistic Abuse Awareness Day. Let’s raise awareness by using the hashtag ‪#‎IfMyWoundsWereVisible‬ on all social media. Get involved in this campaign to raise awareness by logging into your Twitter account and send out a tweet using the hashtag #IfMyWoundsWereVisible and complete the sentence. Let’s try to raise public awareness about this very covert and insidious form of abuse and also reach people with who may not be believed and let them know we believe them, we get it, and there is support and hope for happiness and freedom after narcissistic abuse. You can also click on the Twitter hashtag to read what other people have tweeted. And…I have reduced the price of the soft cover version of my book, I Am Free, starting now through June 1st. 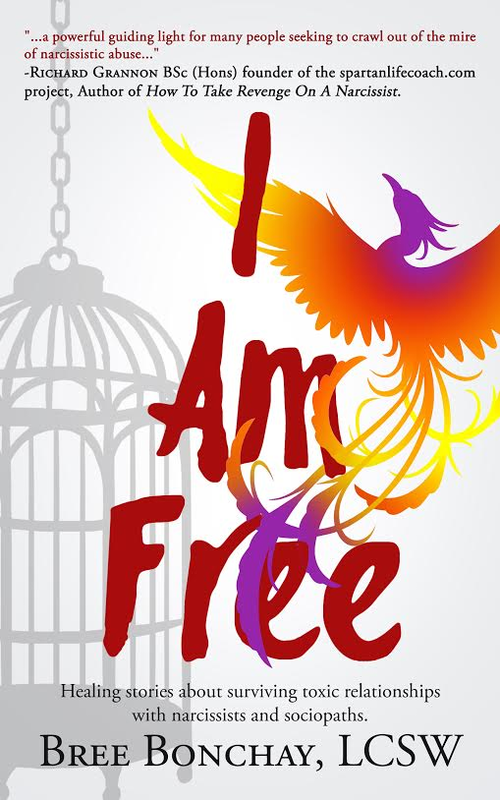 You can purchase, I Am Free, for the special price of $9.99 today and tomorrow. 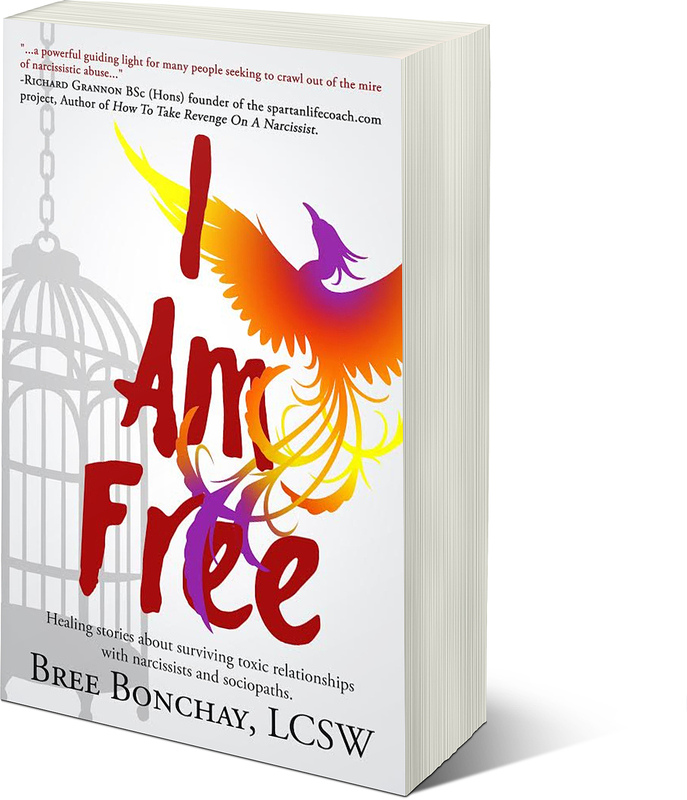 I Am Free, the title of this book embodies its core message. For anyone who has the misfortune of being embroiled in a toxic love relationship or family relationship, the essays shared by other survivors can serve as encouragement that escape is possible. None of the writers sugar coated their experiences or the degree of effort that it took to survive, leave and heal from such traumatic relationships. These stories are brutally honest and chronicle the careful grooming process so typical of these kinds of unhealthy and damaging relationships. This makes for a challenging read, AND IT IS IMPORTANT that they are read as both a cautionary warning and an illuminating light so that others might escape and or avoid the perils that these stories narrate. Written from the heart of survivors of narcissistic abuse, this collection of stories and poems will empower readers dealing with the aftermath of a toxic relationship and serve as a wake-up call to those who are in—or think they may be in—an abusive relationship with a narcissist or sociopath. I Am Free validates and inspires the victims of toxic relationships with the experiences of people from all walks of life—featuring both women and men who have found the courage to survive abusive relationships either as adults or as children raised by narcissists and sociopaths. These vignettes are heavy, raw, and painful, but the ultimate message is one of hope—that it is possible to gain happiness and freedom after narcissistic abuse. Wow! Excellent book, highly recommend it, exactly what I needed to set myself free! Have you noticed that so many narcissists exhibit disturbing behaviors around food? I mean, many of them hoard it and diligently keep track of every item in the refrigerator and pantry. Many don’t like to share it, not even with their own children. They often will make you feel bad for eating it. And at other times, they will make you feel bad for not eating it. I bet you have asked yourself this question at least a hundred times, “why is it so hard to get over the narcissist in my life?” It probably doesn’t make much sense to you why you’re struggling so hard to move on from someone whose rap sheet of wrongdoings toward you is a mile long. It should be easy to let go of someone who has caused you so much pain… right? Well, not really when you understand the interplay of factors that contribute to the concept of cognitive dissonance. It’s no secret that today’s society has grown increasingly more health conscious than ever before. Healthier alternatives are springing up in the most unexpected places like fast food restaurants of all things. And caloric counts displayed next to menu items has almost become the rule instead of the exception. Health conscious people are opting for organic over processed foods. Gluten-free substitutes. Wraps in place of bread. Alkaline water instead of tap water. Packing lunches for work in lieu of eating out, and yet the vast majority of health conscious people fail to consider that the stress caused from toxic relationships, whether with spouses, partners, family, friends, and even co-workers, can be just as damaging to their health and well-being as the foods they’ve so resolutely eliminated from their daily diets. 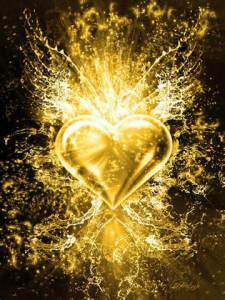 A very powerful article by Malignnarc written from the perspective of the narcissist. Please do not read if you feel you might be triggered.